It is my family's tradition to visit this ever popular temple in Jenjarom, Selangor, during Chinese New Year each year. For those who do not already know, Dong Zen Temple has the largest and most beautiful lantern and flora festival as well as costume parade in town during every CNY! Read about my CNY experience there in 2014: HERE. This year, the main character used for the decor is of course the God of Monkey. Because it is my year (Yes, now you know how old am I! ), making a visit here is mandatory despite of the long 1++ hour journey, excluding the additional jam all the way into the temple for another half an hour. Hence, my advice is, be early to avoid the traffic congestion. Reaching there before 6pm is perfect to find a nice parking and enjoy the bright festive ambiance before the night falls. under the good lighting. The only downside is, it is quite sunny and hot there. Another method of making your wish comes true is to give some donation into the automated donation box, then the Guan Yin statue will light up and it's time to make a wish in front of Buddha. Finally, press the green button and you'll get a Dharma card, with some "tips" written on it. During the day, Dong Zen temple has various line-ups of activities, such as Dharma service, Dharma talk, Cultural Show and the Offering of Lights ceremony around the main hall area. After performing our rituals, we manage to catch the dragon and lion dance performances too. How lucky! We then quickly settle our dinner at the Vegetarian canteen there, offering various types of bread, rice and noodles ranging from RM7 to RM10, as well as drinks at RM5 each. After dinner, the rest of the evening is well-spent by enjoying the beautiful decors around the spacious garden and taking tonnes of pictures with them. Approaching evening, the colorful lanterns are all lit up, creating an amazing ambiance that never fails to fascinate us with its charm. 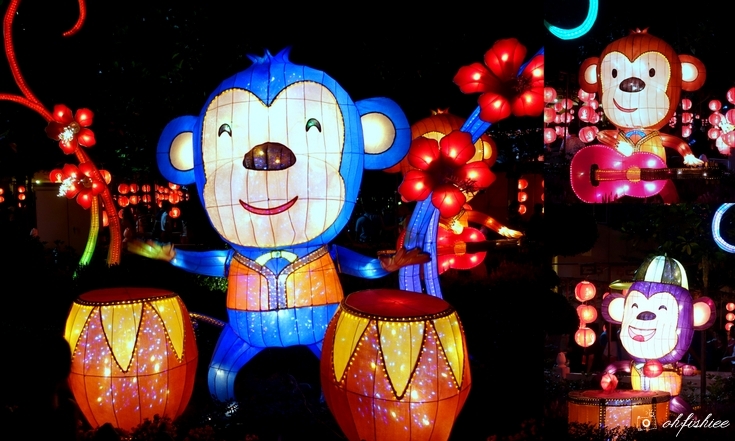 This is especially when these monkey lanterns are not those generic ones; They can move and rotate! Honestly, there are so many beautiful lanterns in different shapes, for instance the 12 Chinese zodiacs, Minions, Madagascar characters and more. The highlight of the evening is of course the daily costume parade held around 9.30pm, throughout the CNY period. Everyone has been waiting eagerly for the special appearance of the God of Monkey, God of Fortune, Guan Yin Buddha and more. By that time, the whole temple is flooded with huge crowd, hence it can get a little stuffy. Tips: Remember to bring your fan along to keep away those sweats! In case you are wondering how huge is this lantern-decked Dong Zen Temple, it actually sits on an area of 16 acres. Hence, you can easily spend 2-3 hours just to briefly walk through the entire area and take some photographs. I personally prefer spending the whole evening there, enjoying the views both during bright daylight, and at night. waw.. look beautiful in d nite..
Every CNY this place is really crowded! but the view is really nice! Looks very happening. I want to bring my Little Angels there next year and I'm sure they will love the temple too. so happy to read from your blog post. We no plan to go this year as been a busy year. I went to this temple for the cny lantern festival few years ago. They still preserved the place and looks good. Beautiful lanterns and Guan Yin! Happy Chinese New Year to you Fish. Love this post!. Thanx to the pics, it did give me the feel that I was there in person. Bravo Fish!! !